Again, Site Rollback, List not Updated, but plugins are. All components are OPTIONAL, and most are OPT-OUT, make sure you remove what you don't want, if you don't want the default settings. Make sure to have ONLY ONE game installation. Either x86, Either x64. NOT BOTH, ONLY ONE. As of 1.0.116.0 You should see a choice upon pressing next if both versions are installed. I was wondering why my HF Patch shortcut had broken, thank you for updating! If you don't mind me asking what is the purpose for a whole new thread? Looking forward to getting back to CM3D2, really thank you! Edit: OH I see is unofficial patch nevermind, thank you ! Hmm maybe I do something wrong.. I got a error when chose directory "Installed Game version (116) may have some issues with this Patch. Consider checking for a updated Patch version." I finished install and when load game no translation or uncensor work. Sorry to bother, do you know what happened wrong? Try doing it on a fresh install, backup your saves and reinstall the game if necessary, and make sure you install (with the update.exe, not copying the files) the cumulative patch [Ver.1.00～1.14 -> Ver.1.15 ]（1.3 GB）, not only the 1.15.1 (116) hotfix. Okay! I'll try, thank you! Great job usagirei ! But didn't work on my computer. I use the (x86) thought. Maybe that's because of that ? Are you on a 64-bit (or even a 32-bit one) system and also have the CM3D2x64.exe alongside the CM3D2x86.exe in the installation directory? Did my setup install the 64bit or 32bit files? Does running reipatcher from the bat files work? Come on now people, I can't help if you simply come in and say "doesn't work, what do?". The game crash with the "yotogi class skill" error when I use the reipatcher install. I am on a 32 bit system. But I have the CM3D2x64.exe algonside my CM3D2x86.exe(weird cause I know I can't use it). Maybe I have to delete it(I saw that you can't have both for your patcher, never knew that I had them tought). And no running reipatcher from the bat files don't work. 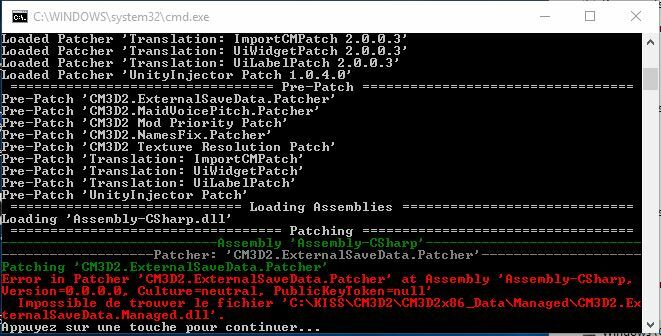 Edit : The patcher only detect the x64 version not the x32(x86) one. and there is the screen. Last edited by Xenjio; 11-05-2015, 01:03 PM. Did you install the chu-b lip skill remover? EDIT: I think i know what error is that, it's a small messagebox when booting right? Could i get a screenshot of the error if possible? I deleted the x64.exe and work great now ! Thanks ! Okay new error after run patcher. Now game don't even launch I bad at this maybe. "(0) Yotogi.Category enum parse error." Is error message when I try to launch game. I dont understand if this is a regular problem or just maybe I broke something... If you have any information that could maybe help me I love to hear. But no pressure, to me maybe this doesn't sound like a HF patch error and maybe just game installation error at this point. Time for fresh install now I think if there is nothing information you have Thank you again! Edit 2: I try remove x64 folder and exe too and rerun HF patcher and it works now too! Thank you both! Last edited by norafromfallout; 11-05-2015, 07:19 PM. What is Change Motion English Version 1.4.0.0? Also, how do you use mods with the mod priority patch? Can you put folders in the mod folder?